I have to admit, I’m quite fascinated by MLB.com’s Franchise Four campaign, in which people are encouraged to vote on the four players that best represent each franchise. Since I love baseball and I like sharing my opinion, I’ve decided to not only participate in the voting, but to share my thoughts on my blog. The aim here is to make my picks for one team a day for the next month, so stay tuned and we will see who the voters picked at the All-Star game in July. The Argument: Teddy Ballgame is quite easily the greatest Red Sox player of all-time and is always one of the first names you think of when you talk about the greatest hitters to ever play the game. Williams played his entire 19 year career with the Red Sox and slashed a ridiculous .344/.482/.634 and hit 521 homeruns and had 1839 RBI during his tenure, numbers that are even more mind-boggling considering he missed three full seasons during his prime while serving in the military during World War 2. His career OPS was 1.116 – a number no player has reached in a single season since Barry Bonds did it all the way back in 2004. His career .482 OBP is the highest of all-time and he’s also the last player to hit .400 for a full season. He won the AL MVP in 1946 and 1949, was a 17-time All-Star, and, of course, was inducted into the Hall Of Fame. The only thing missing from Williams’ sterling resume is a World Series title. The Argument: Thanks to Ted Williams’ three years in the war, Carl Yastrzemski is the Red Sox all-time leader in at bats, hits, runs, and RBI. He also slugged 452 HR and is the only player to rope over 3,000 hits in a Red Sox uniform. Yaz won the 1967 AL MVP when he hit for the Triple Crown by batting .326 and hitting 44 HR to go along with 121 RBI. Yaz is a Hall of Famer, 18-time All-Star, and won 7 Gold Gloves during his career. 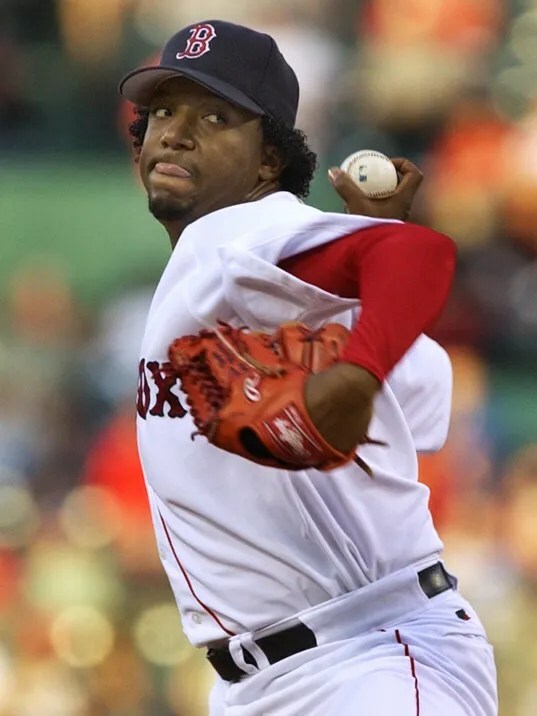 The Argument: Roger Clemens and Cy Young might have the most wins in Red Sox history and both pitched more innings, but Pedro Martinez is the best pitcher to ever wear a Boston uniform. Many would argue that Pedro’s 7 year stretch with the Red Sox is the most dominant by a starting pitcher in the history of baseball. Not just for the gaudy numbers – we’re talking 117 wins, 2.52 ERA, 5.44 K:BB ratio, 10.9 K/9 IP, .206 batting average against – but for the fact that he did it right smack dab in the middle of what we now call The Steroid Era in the brutal AL East where far more than half the games were being played at Fenway, Yankee Stadium, and the Sky Dome, all parks that heavily favor the hitter. He won four American League ERA titles and 3 strikeout titles. For his efforts, he was the recipient of two Cy Young Awards (and four more top 4 finishes) and was inducted into the Hall Of Fame in 2015. The Argument: David Ortiz has become so ingrained as the face of the Red Sox that most casual MLB fans would probably be stunned to learn that he actually played parts of six (6!) seasons for the Minnesota Twins. During his time with the BoSox Ortiz has clubbed 412 HR and posted a .289/.386/.566 triple slash line. Big Papi is a 9-time All-Star and has finished top 5 in the AL MVP voting five times. What probably endears Ortiz to Sox fans more than anything else is his role in their run to the 2004 World Series title, when he seemed to single-handedly will the Sox past the Yankees in the ALCS after losing the first three games to their hated rival. Not only did Ortiz play a huge role in ending one of the longest championship droughts in all of sports, but he also won rings in 2007 and 2013 and has hit .455 in the World Series for his career. After looking like he might be declining in his early 30s, Ortiz resurrected his career and has continued to bash well into his late 30s and should make a strong case for a Hall Of Fame DH when he becomes eligible within the next 10 years.